Did you know that idling a car for one minute releases the same amount of toxic chemicals into the atmosphere as three packs of cigarettes? Grades of Green Youth Corps Eco-Leadership student, Penn C., teamed up with his friends to promote No Idle Zones at his school, Grandview Elementary. Penn recruited students to join his team, and the group spread the word about the importance of not idling car engines in school pick-up and drop-off areas. Penn created educational signs, and walked around the two pick-up and drop-off areas at the end of the school day to encourage people to turn of their engines. If students walked or rode their bike to school, they were rewarded with a pencil made from recycled materials. Great work Penn! 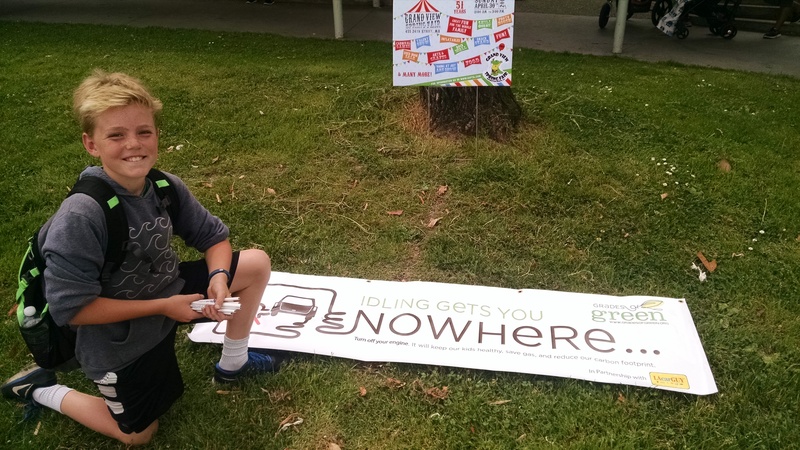 Interested in implementing Grades of Green's No Idle Zone Activity at your school? Click here for all of the resources you need to get this activity up and running!